Individuals and companies use GovTribe in a variety of ways. Your use of the platform may vary depending on a number factors, but in this article I want to highlight the things you can do that will best demonstrate the site's major features. Your 14 day free trial is on GovTribe's Standard Plan, which allows you to collaborate with up to 10 users. To try the team sharing features on GovTribe, go ahead and invite some of your colleagues to participate in the trial with you. 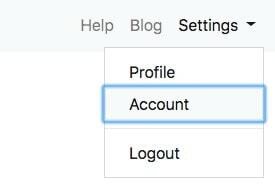 Once you are logged in to GovTribe, go to Settings → Account in the top right menu. On the Account page, scroll down to the section titled Manage Users and click the green Invite User button. The first thing you see after logging into your account is your Dashboard. 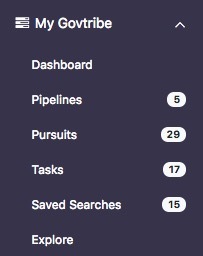 From your Dashboard, you are able to quickly see what you and your team are working on - what your Pipeline looks like, a list of open Tasks, and a list of Pursuits that are due soon. You can also quickly see some industry stats for your company, like a list of active contracts that are soon expiring. 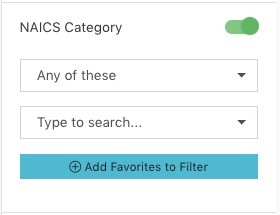 And once something is favorited you are able to quickly add it to your filters when conducting any search. 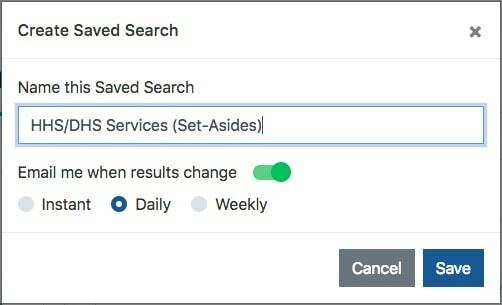 The Saved Search feature is a the natural extension to GovTribe's opportunity search, and it is very easy to do. Once you have constructed a search on one of the opportunity search pages, simply click the Save icon. You will given the opportunity to name your Saved Search and set your email notification preferences. 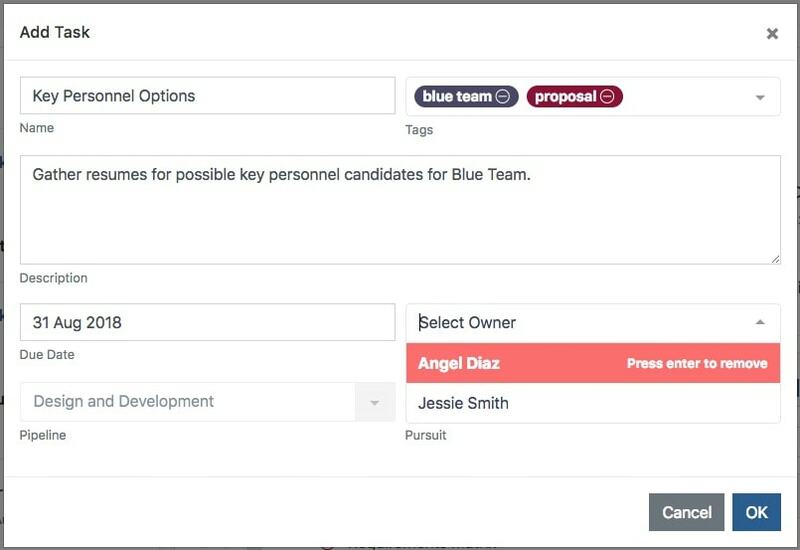 Pipelines on GovTribe are customizable workflow tools that you can use to collaboratively manage your business development activities with a team. Business development activities can include opportunity identification, opportunity research, proposal development, proposal review, and projections reporting. Fill out the information in the pop-up box to complete the process. As you identify opportunities you wish to consider for possible bid, you can easily add them directly to a pipeline as Pursuits. Each Pursuit page becomes a collaboration space for an individual opportunity review and proposal development effort. Begin by identifying an Opportunity that you wish to add to your Pipeline as a Pursuit. These would be items you would find via Federal Contract Opportunity search or Federal Grant Search. On each opportunity page, there is a Pursuits button in the upper right corner. When you click that button you are presented with two options. Select Add as new Pursuit and you are presented with a pop up modal. You must complete the information in the first two tabs in order to finish creating the Pursuit. 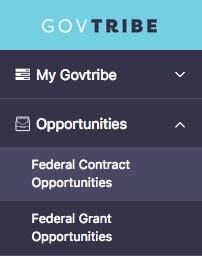 In addition to contract and grant opportunities, GovTribe also has information about current and past contract and grant awards and spending. You can use this information to research a market segment, find information about currently active or upcoming expiring contracts or grants, or investigate competitors and incumbents. 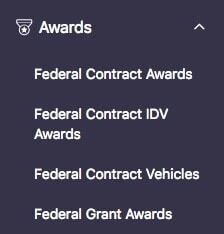 Award information is searchable via four search pages on GovTribe, sorted under the Awards section of the navigation menu. The first three items of this menu section are related to federal contracts, and enable you to search the three levels of the Federal Contract Award Data Hierarchy. The fourth item enables you to search Grant Awards.